The Mitutoyo M Plan Apo NUV 100X is a Long-Working distance objective, Optimized for Near UV to Visible wavelengths (355nm to 620nm), it is color-corrected within these wavelengths. 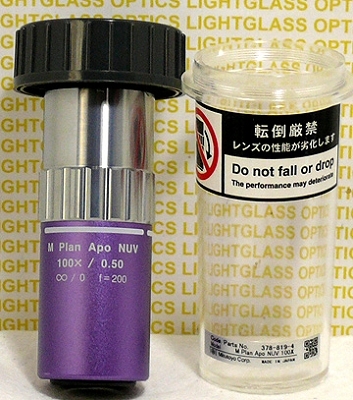 This objective is often used with cameras and is compatible with MT-L Tube lens systems. With its 11.0mm working distance, and a depth of focus of 1.1 microns, this is useful in Near-UV work. The numerical aperture is 0.50 and this highly-corrected objective is optimized for bright-field work. It is strain-free and has a very flat field and excellent color rendition. This is for Infinity-Corrected system and is Mitutoyo part number 378-819-4. We have the ones with the light blue exterior.